Many societies have worshipped the Fertile Goddess as the supreme site of fertility, motherhood, and the creation of life. The earliest proof comes from archaeological finds—paintings and figurines of women with exaggerated secondary sexual characteristics, which emphasize fertility. 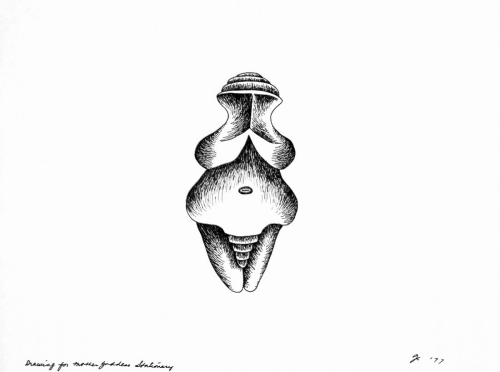 Famous pieces, such as the Venus of Lespugue and the Venus of Willendorf are Upper Paleolithic (30,000–10,000 B.C.E.) examples that may have been worshipped as goddesses. Scholars have suggested that they may have been sculpted by women looking down at their own bodies. These figures are assumed to be pregnant because Paleolithic and Neolithic (around 10,000 B.C.E.) people did not have enough fatty foods in their diet to be able to attain that weight. These types of female votive figures were widely produced and worshipped by very early civilizations such as the Indus Valley Civilization, also called the Harappan Civilization (2500-1500 B.C.E. in modern day Pakistan and Northern India), and ancient Sumer (3500-2025 B.C.E. present-day southeastern Iraq) at a time when men were only depicted as infants or children. Marija Gimbutas, a leading scholar in the study of early goddess worship, has linked the prehistoric goddess figures to water, having found early female figures incised with symbols denoting water in its various forms, as well as imagery linking rain and streams with breast milk and amniotic fluid. In The Language of the Goddess, considered a significant work in the field, she suggests that these figurines and their associated symbols, found throughout the Neolithic period as well and into the Bronze Age (2000–1400 B.C.E.) in Crete, could represent a goddess religion that was passed down through time. One of the most important archaeological sites for scholars of early goddess worship is the Neolithic town Çatal Hüyük in Anatolia (present day Turkey). Çatal Hüyük was perhaps the first urban center, an agricultural society that subsisted on trade and was wealthy enough for its citizens to own luxuries such as mirrors. It was also a city of shrines, with a shrine for every four or five houses. Most of these shrines were dedicated to the goddess, usually depicted as either pregnant or in the process of giving birth. Many early fertility goddess images have been found at Çatal Hüyük, both painted on the walls and as sculpted figurines. Many scholars and archaeologists have used the excavated site to theorize about an early matriarchal society in which the primary divine being was the Fertile Goddess, a model for subsequent goddess worship traditions. 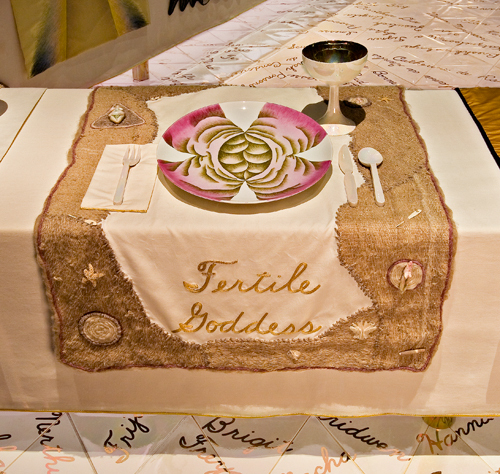 The place setting for the Fertile Goddess includes prehistoric elements related to early societal roles for women and to worship of the goddess as the site of birth and nourishment. All the materials on the runner were made with techniques probably used by Paleolithic-era women to produce similar objects. Bone needles were handmade from cow femurs and the wool was spun on a drop spindle, one of the earliest tools invented by women. As in the Primordial Goddess place setting, the coil is the predominant form on the runner; it refers to the early coil baskets and pottery made by women. The coarse burlap used as the backing references early textiles, another product believed to have been produced exclusively by women. This place setting pays tribute to the pottery, baskets, and textiles Neolithic women traditionally created, many of which were used for farming and food cultivation. As farming marks the start of the Neolithic period and is considered responsible for advancing civilization, the place setting also signifies women’s roles in shaping ancient society. Many of the formal and stylistic decisions for the runner and plate were influenced by early goddess images, such as the Venus of Willendorf. 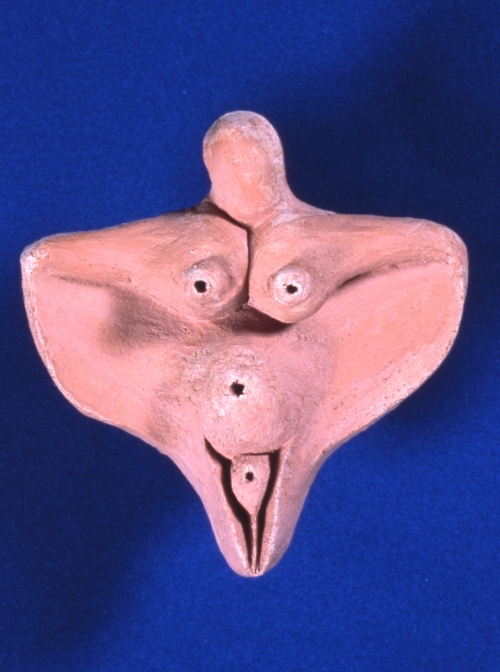 These objects were thought to have been used as amulets and for worship by both men and women; their ample forms are echoed in the fleshy qualities of the plate. 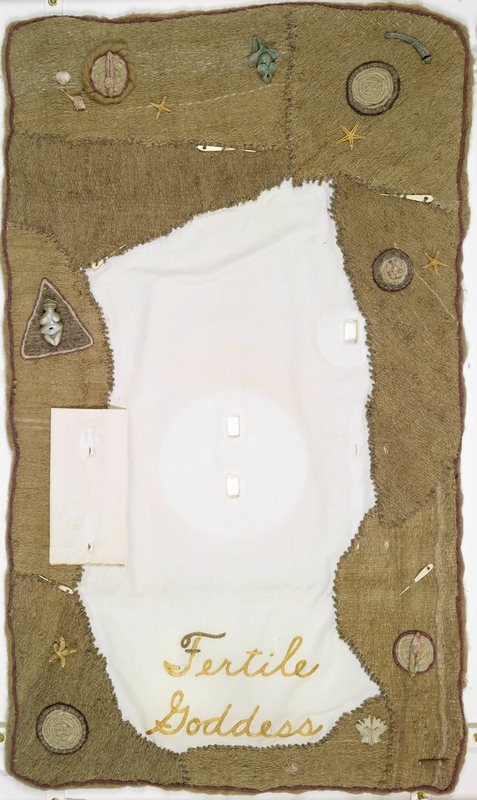 Figures woven into the runner represent early reproductions of the female body, effigies that were used to worship women as creators and nurturers. Shells and starfish adorn the runner and refer to the association of the sea with women, fertility, and goddesses, such as Venus. 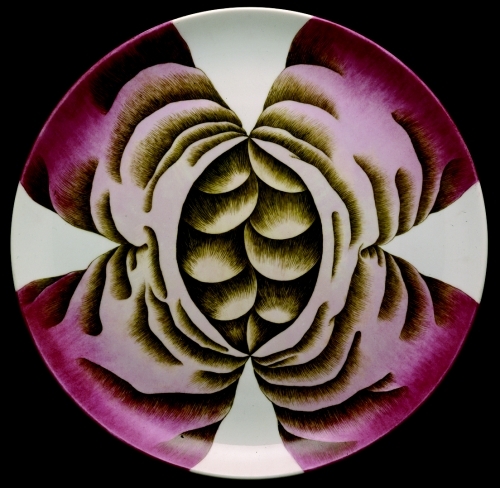 The plate’s central core (or vulvar) imagery includes round forms suggestive of breasts and other natural elements linked to female fertility, such as seeds. Goodison, Lucy, and Christine Morris, eds. Ancient Goddesses: The Myths and the Evidence. Madison: University of Wisconsin Press, 1999.